There are various mathematical formulations that "describe" the behaviour of a device like a loudspeaker. In most cases one needs advanced math to understand them. In our case we follow a different approach. A formulation is necessary only if it a prerequisite in our design procedures. Having that in mind we have formed this tutorial in such a way that will make the reader capable of applying the necessary design steps later on. Let's see whether we have done it in the right way. Music signal is represented by a time-varying voltage. This voltage consists of multiple oscillations at various frequencies. This composite voltage is applied to loudspeakers which in turn produce a composite pressure wave. To work with loudspeakers we take a voltage at a given frequency. The pressure produced bears the same frequency and is proportional to the voltage applied. Thus the ratio "pressure per voltage unit" is constant for a certain loudspeaker. This ratio is called "SPL or Amplitude Response" and is not constant regardless of the frequency value (SPL stands for Sound Pressure Level). 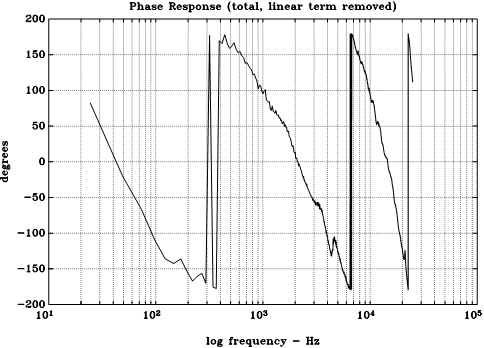 The following graph illustrates how SPL Response changes with frequency for a tweeter driver. Each loudspeaker exhibits a useful operating freq.range outside which its pressure output is weak. In the case of this tweeter this range lies between 1kHz and 20kHz which is rather typical for a hi-fi tweeter. The two smaller curves below the main SPL response are not discussed at this point since they describe a different issue, that of the distortion. So please ignore them. A close view of the response curve reveals that below 1000Hz output pressure rolls-off at a steep rate and that within the useful frequency range this driver produces approximately 94-95 dB of SPL. What is not mentioned is the voltage applied for this measurement to be taken. In general all SPL responses are per 2.83Vrms of input. This value is conventionally chosen because it delivers 1 Watt of power to an 8 Ohm driver (almost all hi-fi woofers and tweeters for domestic use are 8Ohm). So an SPL Response is usually expressed in dB SPL per 1Watt (or 2.83 Vrms). 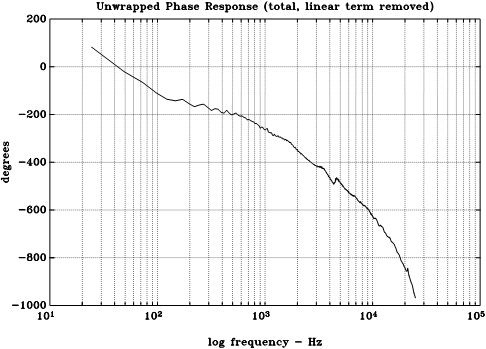 The average value of the SPL Response curve in the useful frequency range (ie. the almost straight horizontal part of it) is called Sensitivity of the driver. Ordinary woofers and tweeters produce 88 to 90 dB SPL/ 1W of Sensitivity. Sensitivity is a feature which must always be taken into account when buying loudspeakers. 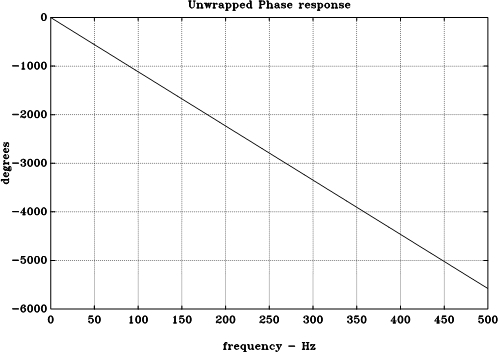 The figure on the right is the SPL Response of a woofer. Woofers' SPL Responses are higly irregular. They have a lot of dips and peaks. Surely this driver's useful frequency range stops at about 4.5-5 kHz. Is begins at 55-60 Hz but this part of the Response curve depends strongly on the fixture on which the driver was mounted during measurement. Laboratory setup is critical for the assessment of woofers since the low-end of their SPL Response is almost entirely defined by the enclosure and the baffle used by the engineers. Tweeter Responses are only affected by the area and the shape of the baffle at which the drivers are mounted during measurement. -So what is the point for manufacturers to measure SPL Responses if the resulting graphs are not valid for a speaker system we may build with drivers we buy at the market? During the design process we will develop criteria for the safe comparison and selection of drivers according to published SPL responses and our project's enclosure volume and baffle area/shape. -Can we have a look on the SPL Response of an ideal loudspeaker ? It is not a difficult issue to define the perfect, the ideal shape of a driver's SPL Response. A Woofer driver is subject to the general restrictions that hold for all loudspeakers: It can not reproduce frequencies lower than a limit imposed by its diameter and higher than another limit imposed by its diaphragm mass and some other electrical parameters. In other words woofers (and tweeters) are Band-Pass devices. All we want is to have a high Sensitivity value and a flat shape in the Pass-Band frequency range of its SPL Response. 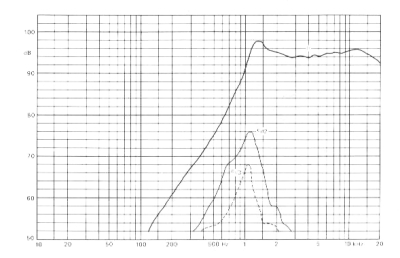 Figure on the right is a good example of an ideal woofer having a flat Pass-Band and a strong Sensitivity value at 90 dB (per 2.83Vrms of input).This Sensitivity value of 90dB SPL is quite typical for domestic use loudspeakers. Frequencies above 2-3 kHz will be sent over to the Tweeter driver. Bass frequencies lower than 100 Hz also seem to be well reproduced by this ideal example. As all Pass Band devices this example driver exhibits CutOff frequencies. A Cut-Off frequency is defined to have a Response value 3dBs lower than the nearby Pass Band Response. In our case the cutoff frequencies of this ideal example driver are those for which the SPL response falls to 87dB. A more detailed view of the same SPL curve is given at the figure on the right. Obviously this driver has a LOW cutoff frequency at 50Hz and a HIGH cutoff frequency at 4 kHz. 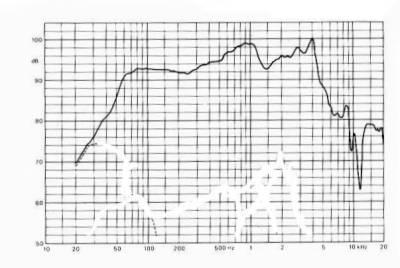 Cutoff frequencies are very important for the assessment of loudspeakers. However ordinary drivers have an irregular SPL Response with a non-flat PassBand range. It is therefore difficult to define a Sensitivity value at PassBand and thence -3db frequency points. The value of -3dB was chosen because it corresponds to a relative decrease of half power. In this sense the device outputs (at a cutoff frequency) half the power of what it delivers at frequencies in the PassBand. An ideal Tweeter driver should manage to reproduce high frequencies in a similar manner. 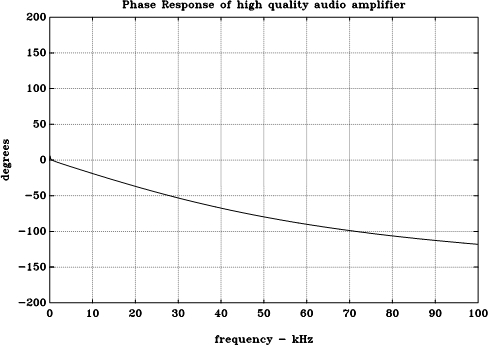 The Figure on the left depicts an ideal example with typical cutoff frequencies at 800Hz and 25kHz. The differences between woofers and tweeters are explained when one considers the mass of their diaphragms and the construction of their voice coil. Lightweight domes are able to vibrate at high frequencies, heavy woofer cones aren't. -Is that all with loudspeakers ? No. There is another issue concerning their behaviour when stimulated with electric voltage at their input : The oscillation of the pressure wave produced is shifted or delayed in time when compared to the oscillation of the electric stimulus. So at each frequency a loudspeaker exhibits a time delay (usually expressed or measured as a phase shift at this frequency). This delay consists of two parts; one due to the loudspeaker's electromechanical structure and another one due to the time needed for the sound wave to travel the distance to the observation point. The first part is unfortunately strongly dependent on frequency for every loudspeaker. Even worse it is never included by driver manufacturers in their product catalogs or datasheets. The second one depends entirely on the geometry of the speaker under development. It is the position of the acoustical center of the driver on the speaker's baffle and the location of listener's ears that will determine it. We refer to a Loudspeaker's Time-Delay or Phase Response. The graph of this Response can not be found in datasheets. It is related to each speaker configuration so the manufacturer can not provide it. We have to either simulate or measure it. -Can we avoid using a driver's Phase Response ? No. In a multi-way speaker project the wave produced by each loudspeaker arrives at the listener's location with a different timing (or phase). These waves add to each other according to this timing. Our design procedure must be able to predict and control this addition. Otherwise we may end up with a significant frequency range for which the waves of the woofer and tweeter drivers arrive at the listener's position with an (undesirable) phase difference of 150-210 degrees. In such a case these waves cancel out! Not only the overall speaker Amplitude Response will exhibit a severe dip (at that frequency range) but the listener will perceive unwanted localization effects of the sound stage (more on this later on). -How does a Phase Response look like? Generally speaking a Phase Response curve is expressed in degrees of phase lag (if negative) of output sound oscillation with respect to input. The figure on the left illustrates the case of a very good audio amplifier. Higher frequencies are delayed a bit more than lower frequencies. Amplifiers usually have good Phase Responses. When we talk about an ideal system that delays all frequencies with the same time value we actually describe a linear Phase Response. 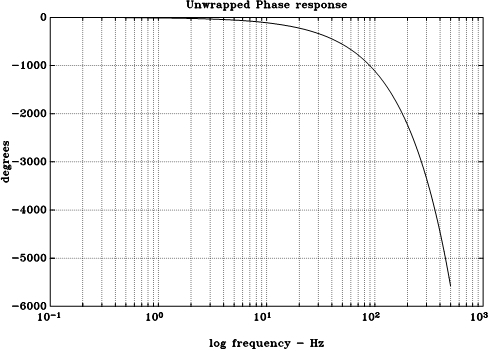 Phase lag is proportional to frequency in order for the time delay to be constant over frequency. This is shown in the figure on the left. However this ideal linear shape is present only when we use a linear frequency axis. The case of the audio amp above is interesting. The shape of its Response is not exactly linear. Therefore we expect some Phase Distortion which is hardly audible. 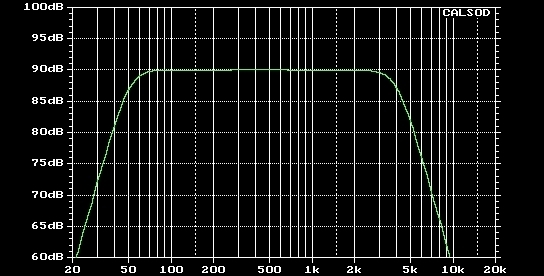 If we zoom to the first 20kHz the shape of the same Phase Response can easily be considered as almost perfectly linear. In most lab measurements and graphs of hifi systems we use a logarithmic axis. Thence the shape of an ideal Phase Response changes (figure on the right). It is still proportional to frequency though the curve is no longer linear. So we must always pay attention to the type of the frequency axis whan we want to judge the Phase Response of a device. The device on the right is a small two way hifi speaker measured in the lab. Roughly speaking (using a visual inspection of this curve) this phase response deviates strongly from the ideal form of the previous figure. This deviation is mainly focused below 1kHz. Things are getting worse below 100Hz. Different time delays are introduced throughout the various frequencies of the audible spectrum. -What is a Wrapped Phase Response ? In most loudspeaker simulation or lab measurement software Phase Responses are plot with a logarithmic frequency axis and a phase axis confined to a value range of -180 to +180 degrees. This relates to trigonometry and other mathematical reductions. Thus phase values between -180 and -540 degrees are shifted upwards by a value of 1 full cycle of 360 deg. Values between -540 and -900 degrees are shipted upwards by a value of two cycles or 720 deg. This goes on ensuring that all phase values are confined to the above mentioned range of -180 to +180 deg. Wrapped Phase Responses are very hard to study and classify. In the last example of the small hifi speaker wrapping its Phase Response creates the curve on the right. Direct evaluation of this Response is a very difficult thing to do and a different approach (introducing new mathematical tools) becomes necessary.